This page will walk through Angular custom preloading strategy example. Preloading is loading modules in background just after application starts. In preloading, modules are loaded asynchronously. Angular provides in-built PreloadAllModules strategy that loads all feature modules configured with loadChildren in application routing module as quickly as possible. Custom preloading strategies allow to preload selective modules. We can also customize to preload modules after a certain delay once application starts. To create a custom preloading strategy, Angular provides PreloadingStrategy class with a preload method. We need to create a service by implementing PreloadingStrategy and then overriding its preload method. To enable custom preloading strategies, we need to configure our preloading strategy service with RouterModule.forRoot using preloadingStrategy property. We will also configure our preloading strategy service into providers metadata in application routing module. On this page we will provide how to create custom preloading strategy step by step. 1. To load a feature module, we need to use loadChildren in application routing module i.e. AppRoutingModule. Find the code snippet. 2. 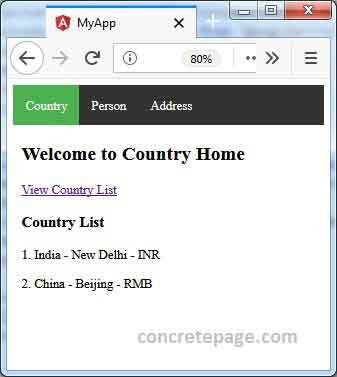 We must not import our feature modules such as CountryModule in application module i.e. AppModule. 3. To configure preloading, angular provides preloadingStrategy property which is used with RouterModule.forRoot in application routing module. Find the code snippet. Angular provides PreloadAllModules and NoPreloading in-built strategies. a. PreloadAllModules: Strategy that preloads all modules configured by loadChildren in application routing module as quickly as possible. We use it as following. b. NoPreloading: Strategy that does not preload any module. This strategy is enabled by default. But if we want to use it, we can use it as following. Angular provides PreloadingStrategy class using which we can create custom preloading strategy. Find the structure of PreloadingStrategy from Angular Doc. To create a custom preloading strategy, we need to create a class by implementing PreloadingStrategy and override its preload method. Let us discuss step by step. Step-1: Use data property in route configuration. data is a property of Route interface. data provides additional data to component via ActivatedRoute. The data property can be used in route configuration as following. We can use data with any number of flags with any name as required. Step-2: Create a service by implementing PreloadingStrategy class and override its preload method. Here we are creating a custom preloading strategy with name CustomPreloadingStrategy. In the above code, we can observe the definition of preload method. This method will run for all modules configured with loadChildren in route configuration. When the preload method finds the value of route.data['preload'] as true for a module, load() is returned and that module is preloaded and if it finds false then we need to return Observable<null> and that module will not be preloaded. Step-3: Suppose we have following route configuration. In the above code snippet, two feature modules PersonModule and AddressModule have been configured. According to our CustomPreloadingStrategy implementation, PersonModule will be preloaded because it is using data property as preload: true. Another feature module AddressModule will not be preloaded. Step-4: To enable our custom preloading strategy CustomPreloadingStrategy, we need to assign it to preloadingStrategy property in RouterModule.forRoot method in application routing module. Find the code snippet. Step-5: Configure our custom preloading strategy CustomPreloadingStrategy with providers metadata in application routing module. Find the code snippet. Here we will create a custom preloading strategy using which only selective feature modules will be preloaded. Find the application routing module. When we access the application first time we will get following output. We can observe that AppModule is loaded and application started. After that feature modules CountryModule and PersonModule are loaded. AddressModule will be lazy loaded. Here we will create a custom preloading strategy using which only selective feature modules will be preloaded with a certain delay. If a feature module has been given delay as true to data property in route configuration, then that module will be preloaded after 5 seconds once the application started. Find the application routing module. CountryModule will be preloaded as quickly as possible. PersonModule will start preloading after 5 seconds once the application starts. AddressModule will be lazy loaded. In our application we have three feature modules. Find the code feature wise. Now find other files used in the demo application.